Dilip Kumar (born as Yousuf Khan), who began as a diffident novice in Hindi cinema in the early 1940s, went on to attain the pinnacle of stardom within a short time. He came up with spellbinding performances in one hit film after another – in his almost six-decade-long career-say-die attitude. His imitators are legion, but it is the original that has stood the test to time. 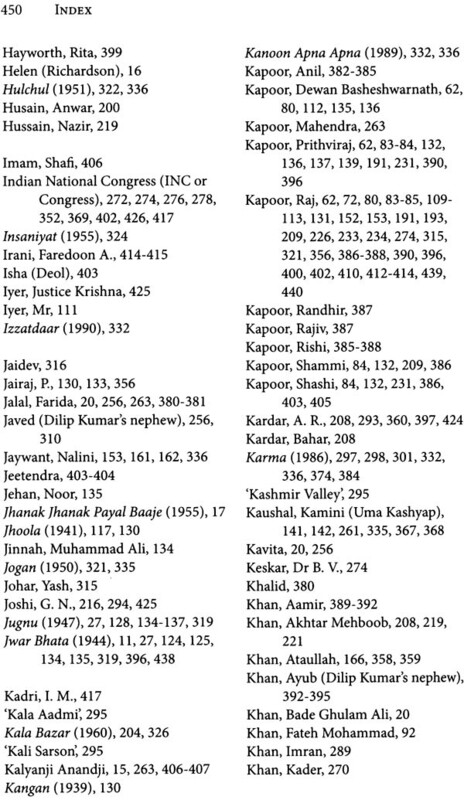 In this unique volume, Dilip Kumar traces his journey right from his birth to the present. In the process, he candidly recounts his interactions and relationships with a wide variety of people not only from his family and the film fraternity but also from other walks of life, including politicians. While seeking to set the record straight, as he feels that a lot of what has been written about him so far is ‘full of distortions and misinformation’, he narrates, in graphic detail, how he got married to Saira Banu, which reads like a fairy tale! 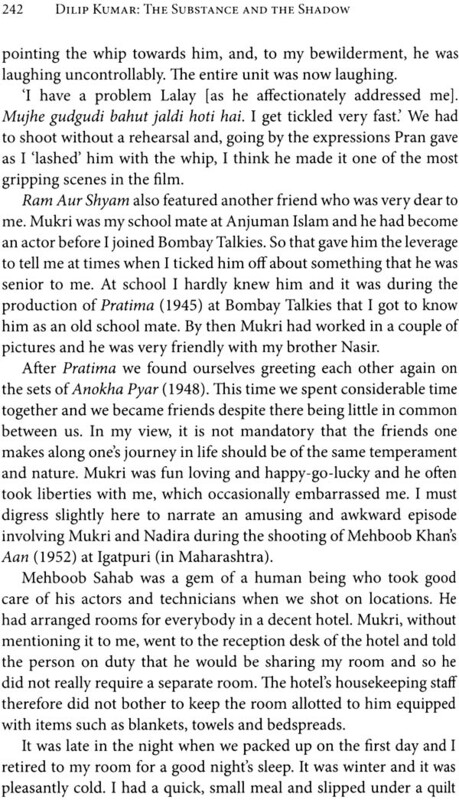 Dilip Kumar relates, matter-of-factly, the event that changed his life: his meeting with Devika Rani, the boss of Bombay Talkies, when she offered him an acting job. His first film was Jawar Bhata (1944). He details how he had to learn everything from scratch and how he had to develop his own distinct histrionics and style, which would set him apart from his contemporaries. After that, he soon soared to great heights with movies such as Jugnu, Shaheed, Mela, Andaz Deedar, Daag and Devadas. In these movies he played the tragedian with such intensity that is psyche was adversely affected. He consulted a British psychiatrist, who advised him to switch over to comedy. The result was spectacular performances in laugh riots such as Azad and Kohinoor, apart from a scintillating portrayal as a gritty tonga driver in Naya Daur. He then opted for a judicious mix of serious and light-hearted roles in film such as Gunga Jumna, Leader, Dil Diya Dard Liya, Ram aur Shyam, Aadmi, Sunghursh, Gopi, Sagina and Bairaag. He then took a five-year break from films and began his productive ‘second innings’ with Kranti (1981), after which he appeared in a series of hits such as Vidhaata, Shakti, Mashaal, Karma, Saudagar and Qila. He has many prestigious awards to his credit. He bagged the Filmfare Best Actor eight times, a record. He is also the recipient of the Padma Bhushan, the Dadasaheb Phalke Award and the Nishan-e-Imtiaz (Pakistan’s highest civilian award). He has also served innumerable philanthropic and social cause in his own unobtrusive manner. This long-awaited autobiography brings out the real Dilip Kumar, who was not only a superlative actor but also a connoisseur of the arts, a voracious reader of literary works in Urdu, Persian and English, a highly gifted multilingual orator, an excellent mimic and a superb dancer! 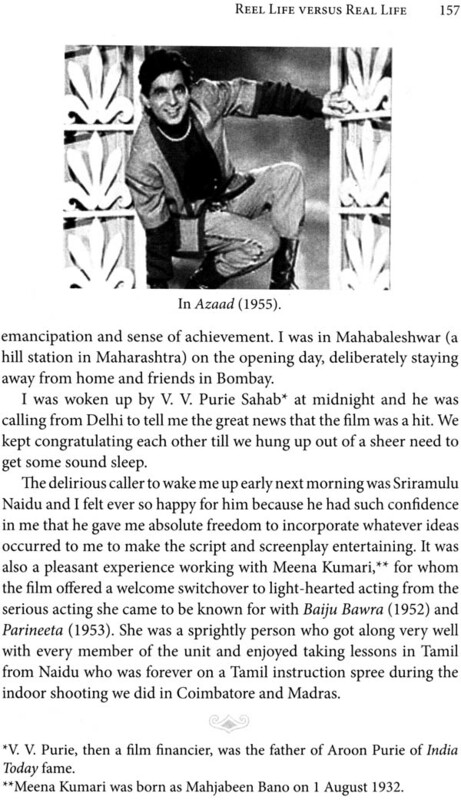 It Is With Feelings of Excitement And Joy That I Pen This foreword to my husband's autobiography, narrated by him, after years of persuasion by me, to my close friend Udayatara Nayar. It has always been an arduous task to prevail upon him to talk about himself, his life and his achievements. I understand it is neither proper nor right for me to extol the virtues of the book you are holding in your hands although I am tempted to do so, the primary reason being my widely known admiration for my husband and the ardent pride with which I have always hung on to every word he has uttered to me or to anyone in my presence over the decades we have spent together as a couple. Such is the magic of his command over words and language, be it English or Urdu, and I have no doubt I am not alone when I say this. When a shy 22-year-old son of a Pathan fruit merchant was selected by the diva of Indian cinema, Devika Rani, to star in her Bombay Talkies' production [war Bhata (released in 1944), it led to a small change of name for the young man. Yousuf Khan became Dilip Kumar. It was the beginning of the arrival of a new legend in Indian cinema and Hindi cinema's first definitive actor was born. Dilip Kumar almost single-handedly redefined histrionics in one screen portrayal after another - from Shaheed (1948), Andaz (1949), Devdas (1955), Naya Daur (1957), Gunga lumna (1961) to Azaad (1955), Kohinoor (1960) and Mughal-e-Azam (1960) - and from Ram Aur Shyam (1967), Gopi (1970), Kranti (1981) to Shakti (1982), Mashaal (1984) and Saudagar (1991). Dilip Sahab has, in his illustrious career, refined acting to an art form of exalted brilliance. 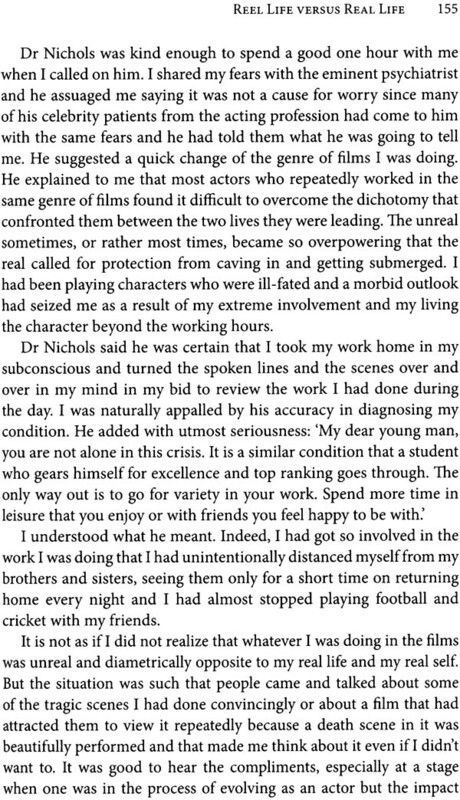 Down the decades every actor of calibre has held him in high respect as the reference point in acting. He went to no school of acting but created his own method of emoting long before 'method acting' came to be known in India or abroad. From the wolf-whistling frontbencher to the most serious critic of cinema, Dilip Sahabs varied range of histrionics has aroused spontaneous admiration while he has been considered the epitome of fine acting for generations of actors who looked up to him for inspiration. His understated elegance and, Mashallah, voice modulation have become role models for all of us actors over the years. 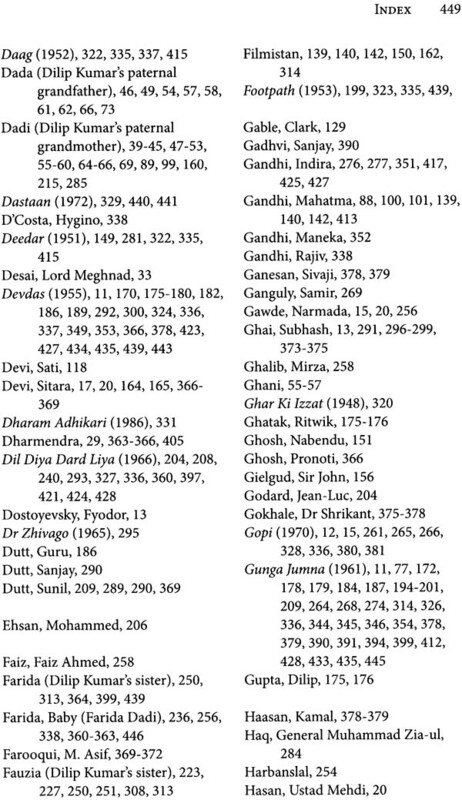 Few among his countless followers know that Dilip Sahab has always been a voracious reader. Whether it is novels, plays or biographies, his love of classic literature has been foremost. The classics of Urdu, Persian and English literature adorn the bookshelves of our home. When he's done with the library bookshelves, we have to be ready to offer him a pick of the thousands of books tucked away carefully in our huge store rooms. Down the years and all through the lifetime I have spent with him, the reading lamp that burns bright by his armchair has shone through the dark hours of the night to the wee hours of the early morning. Be it at home in Mumbai, * or a remote daak bungalow in Dachigam in Jammu and Kashmir, where it would be no surprise to find a hairy bear from the wilderness snoozing on our verandah, or in Kulu-Manali (in Himachal Pradesh), in Switzerland or in any part of the world, when he reads, he is like a child engrossed in his favourite game, unwilling to put it away until time and again I plead with him to rest. If not the biographies or classics or master plot plays by great writers such as Eugene O'Neill, Joseph Conrad, Fyodor Dostoyevsky and Tennessee Williams, he is sure to be engrossed in the writing of a script or a scene that waits to be picturized the next day morning. He took up one film at a time and that was his absolute commitment and focus. 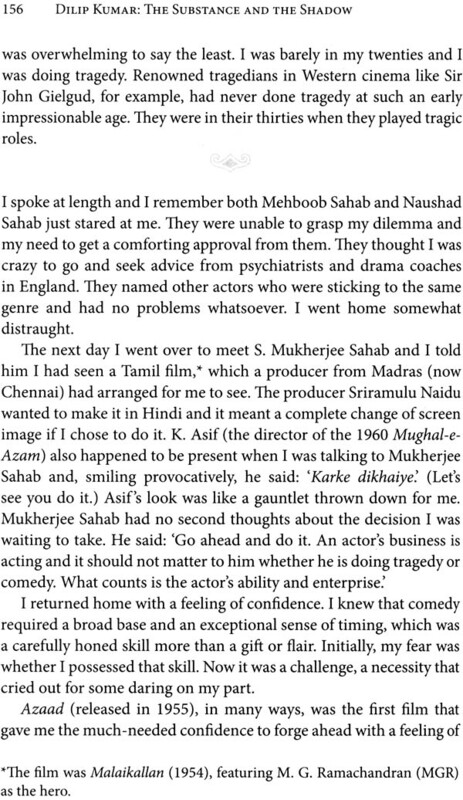 I remember once he was writing and discussing scenes with producer-director Subhash Ghai in the freezing cold weather of Kulu till very late into the night during the outdoor shooting of Saudagar and, after he sent Subhash away to rest in his room, he continued to examine the scene passionately. At about 4:30 a.m. Dilip Sahab had a bright idea and he did not hesitate to wake up Subhash from his slumber to exchange this new brainwave! Then both of them were like busy bees working on the scenes until they were happy with what they finalized and, mind you, they diligently started the morning outdoor schedule bang on time! 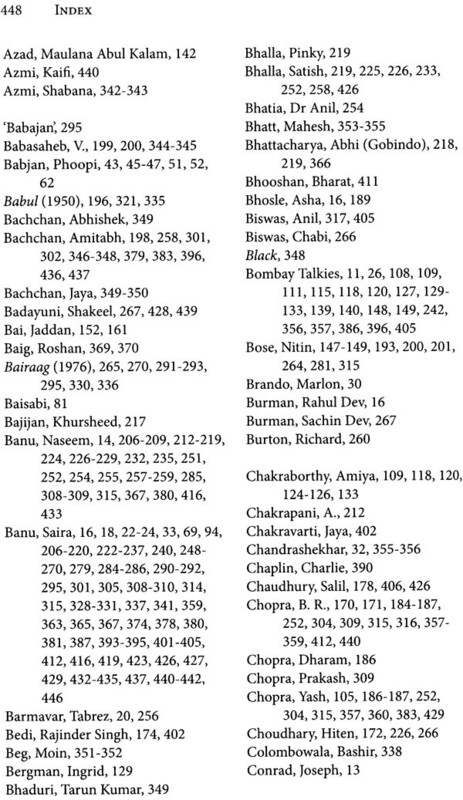 "In this book, we have used Mumbai and Bombay interchangeably as also Madras/Chennai, Calcutta/Kolkata and Poona/Pune. against varying backdrops, will make you part of his journey from the rugged mountain-hemmed North West Frontier Province in British India to hilly Deolali in Nasik district of Maharashtra to glamorous Bombay to traditional Madras to sophisticated London. 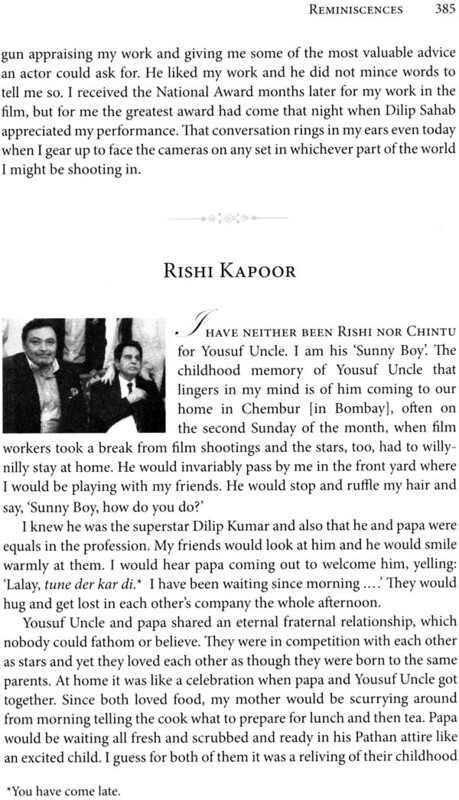 The poignant as well the mirthful experiences he narrates will give you an insight into the making of the legend called Dilip Kumar who, as the title symbolizes, is the shadow while the substance is a simple, child -like, trusting and genial man called Yousuf Khan. Indeed, what I can and would love to share in this unconventional foreword are the unseen and unknown facets of the man and actor I have been lucky enough to know and love deeply from the age of twelve when I first set eyes on him. I want the world that is full of his admirers to be acquainted, through incidents and episodes in the book, with Dilip Sahabs innate simplicity, straightforwardness and immeasurable goodness of heart. I started my life as an admiring fan, and fortunate am I to marry him and see the different aspects and qualities of this great human being who was not like any of the people I had met and spoken to during my extensive travelling almost all over the world with my mother Naseem Banuji from the age of seven onwards. Such a man as Dilip Kumar Sahab, I would say, walks rarely on this earth. I have consciously never oversold or overexposed myself to the audience. When I look back I feel it was quite risky to be starring in one film when other actors were busy with two or three films on the floors simultaneously. I determinedly decided to work in only one film at a time. It was simply my confidence in the subjects I chose and the hard work I was ready to put into them. It Was A Sultry Afternoon In Mumbai’s Midsummer. The year was 2004. I was helping Saira Banu rearrange the books on the bookshelf in her bedroom when Dilip Sahab picked up a book written by an author who claimed to have known him as no one else did. 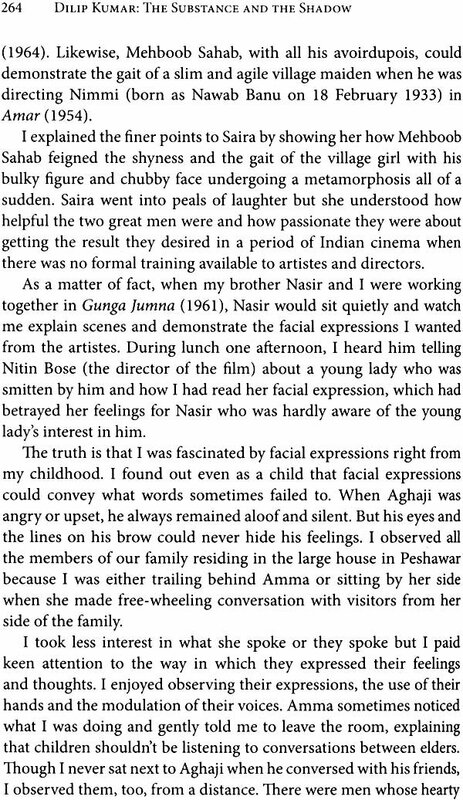 'This is supposed to be my biography and it is full of distortions and misinformation: he told Saira. 'Why don't you write the story of your life yourself?' Saira queried, gladly seizing the opportunity to pursue her continuous effort to pin him down to write his autobiography. 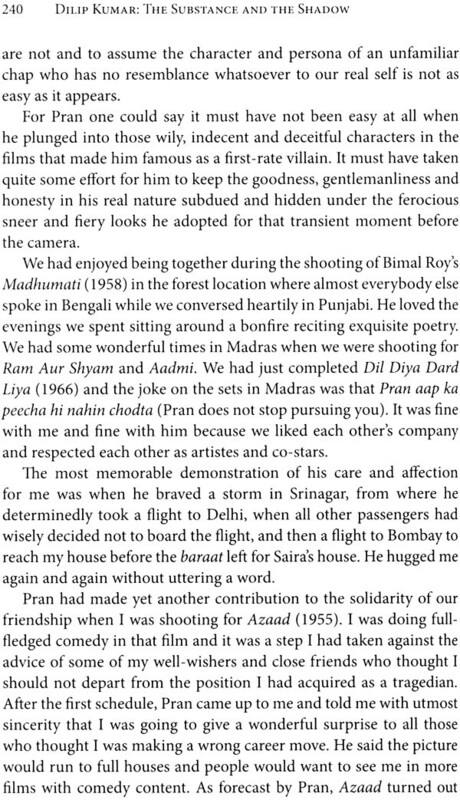 Saira has always maintained that the inspiring journey of a simple youth named Yousuf Khan, son of a well-to-do fruit merchant and the story of his flight to hitherto unparalleled heights of fame and success as Dilip Kumar, who became India's first ever superstar and one of the world's greatest actors, had to be recounted. The real story, she was sure, would enthuse and motivate all young aspirants in any walk of life who have chased dreams of making it big in their chosen professions. After a moment's silence, Dilip Sahab spoke, turning to both of us as we waited to hear his reply. 'All right, I will narrate my story. It has to be compiled by someone who is enlightened and ready to put in the hard work that goes into anything I do and it should be someone who knows us really well: he said. 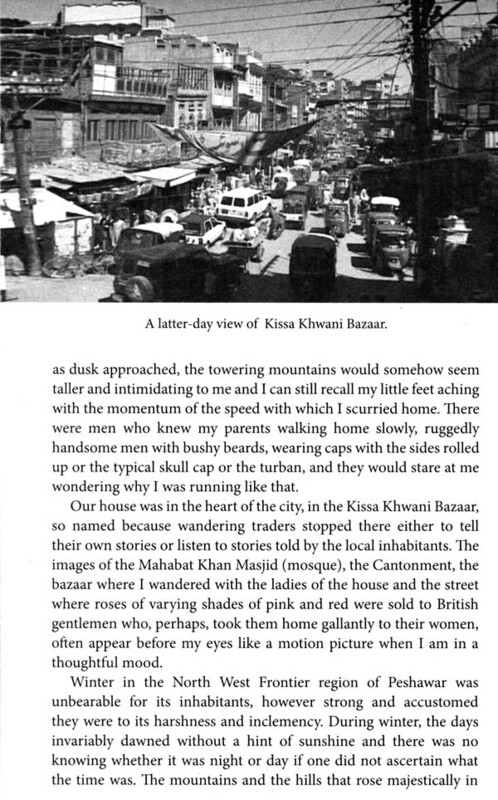 I was listening and continuing to arrange the large collection of fiction and poetry works in English and Urdu, which had been read by Dilip Sahab seriously and meticulously, with pencil lines under sentences that piqued him and notes jotted in green ink in the margins in his elegant handwriting. 'She is right here', Saira pointed out, looking at me. 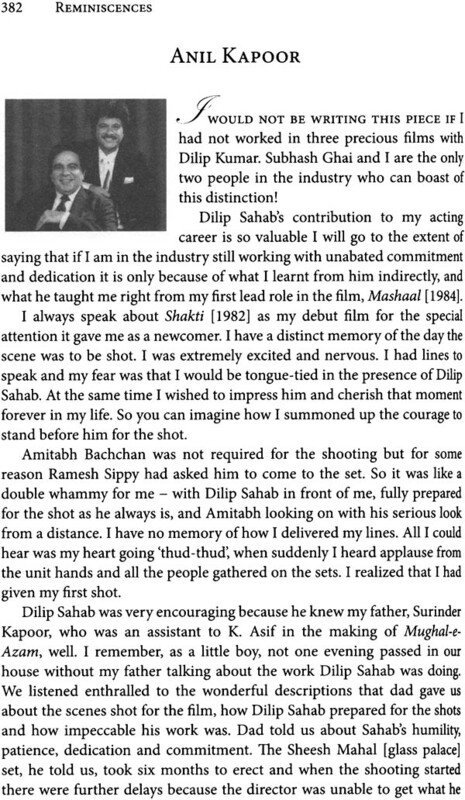 Dilip Sahab too looked at me and laughed gently, seeing the disbelief on my face. 'When do we start?' he asked me and I could hear my heart thumping away with mixed feelings of happiness and fright. Can this be reality or is it a dream, I asked myself since I was not in the fray of renowned writers who were pursuing Dilip Sahab to tell the story of his life to them. Being an extremely private person, he was not always comfortable talking about himself and his unequalled achievements. He had understandably not encouraged anyone to explore his personal life for a book. 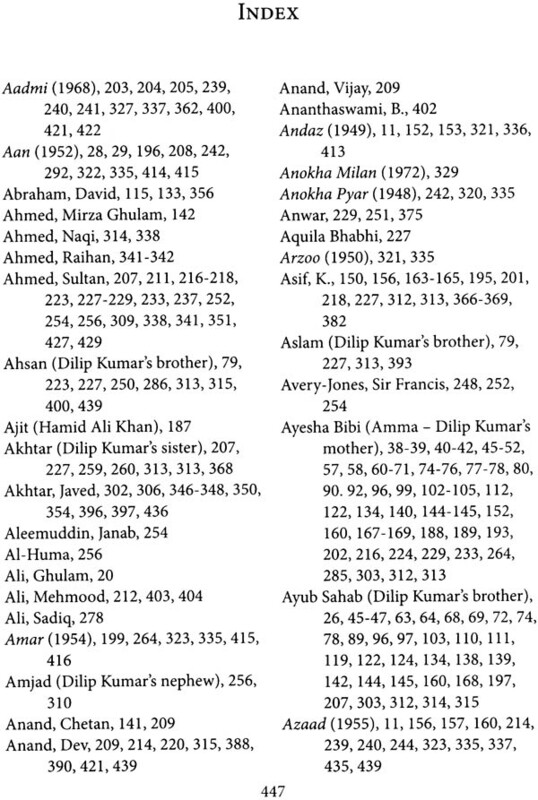 As a result, some of the books that were written by people who claimed to know him and by writers who culled excerpts from published interviews and gathered dubious information from 'close friends' of Dilip Sahab and Saira did not tell the real story. Saira was gleefully hugging Dilip Sahab and exhorting him: 'Let us start today, now, after lunch Jaan, before you change your mind: 'Don't neglect your job's demands for this. I have chosen you because you are capable of painstaking work and you can follow my thoughts and expressions accurately. Also, I am assured you will not misquote me. We will do it at my pace and don't hesitate to tell me if it gets boring: Dilip Sahab joked. Saira, the perfectionist that she is, arranged for high-class tape recorders and writing pads to take notes if the recorders failed. 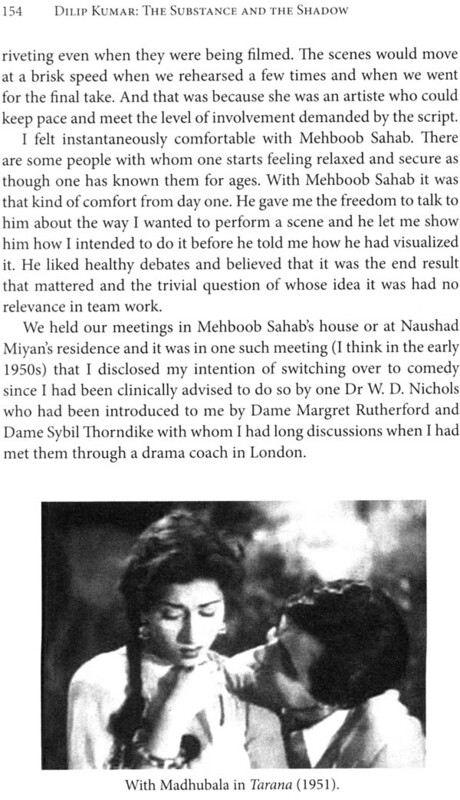 She suggested to Dilip Sahab that it would be a good idea to sit on the lawns in her garden and talk to me, knowing him and his impatience in case his work was interrupted or disturbed. Anywhere else in the house, she knew the phones would ring incessantly. More importantly, Saira knew her husband's love for nature and open spaces. She knew how he disliked talking about himself and how disinclined he was to do an autobiography because that meant, in his words, the profuse use of capital I, which he abhorred. And now that he had agreed, she wanted to make sure he did not lose interest on any account. It was not the easiest assignment of my life for sure. The mood had to be created every day and that was something only Saira could do. The gentle prodding to get him to talk about the leading ladies was again something only Saira could do. Even the untold story of how he decided to marry Saira in late 1966, who was the country's most sought after and highest paid actress at that time, and the charming sequence of the dignified Dilip Kumar style courtship that preceded his proposal to Saira to be his wife had to be gently coaxed out of him. Needless to say, his account of the love story is one of the best chapters in this book. Week after week I sat with him, sometimes in the shade of the large mango tree in the garden, sometimes in the drawing room, sometimes at the Otters Club (a sports institution in Bandra, Bombay) on the lawn facing the sea from where he loved to watch the sun go down, leaving behind a trail of gold and vermillion in the sky. The tape recorder accompanied us wherever we went and, quite often with his permission, a video camera, too, followed us unobtrusively. As the recordings continued, the real picture began to emerge. I began to see the unfolding of his saga like the scenes in a movie. 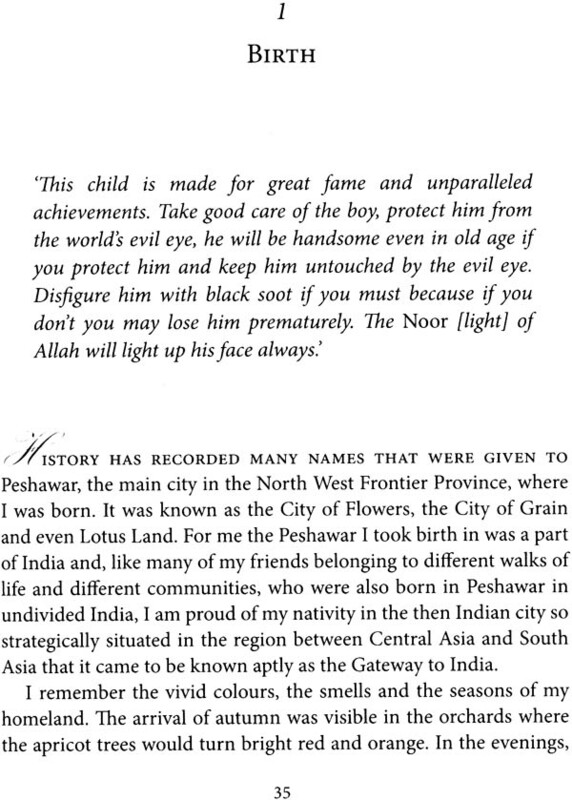 While he narrated his story in his soft voice, I noticed how much he enjoyed the recapitulation of his childhood years in Peshawar and Deolali. 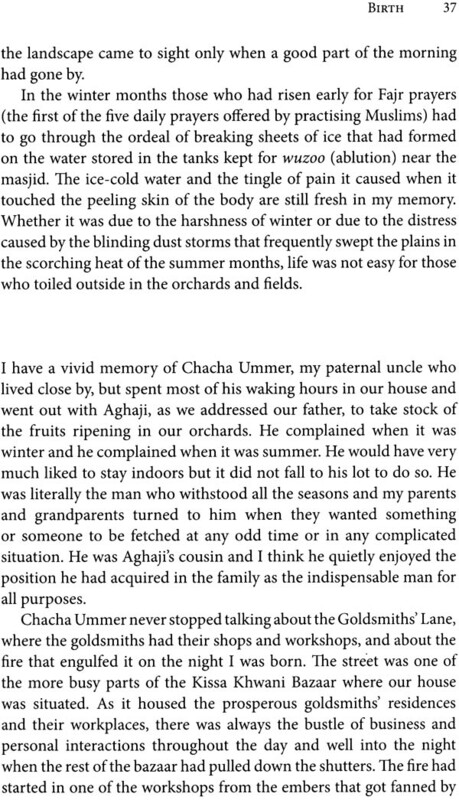 I could equally feel the pain in his heart when he talked about his elder brother Ayub Khan's brilliance and his chronic ill health, which cut short a promising life. His was simply not just the amazing story of the young graduate Yousuf Khan, who excelled in school and college sports, seriously searching for a job in British-ruled India and hesitatingly accepting the job of an actor from the premier film studio of Bombay, Bombay Talkies. It was also not just about Yousuf Khan's unrelenting hard work, which propelled his rise to superstardom as Dilip Kumar and his occupying the pedestal as the icon of acting in Indian cinema for more than seven decades. I also learnt, more interestingly, how he set an example by the management skills he evolved by instinct and native intelligence to manage his career and create his USP. 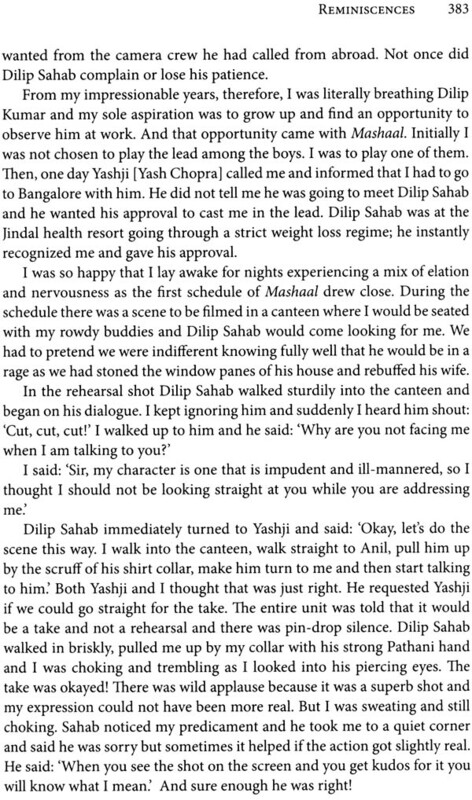 In the early 1940s, when Dilip Sahab started his career, the concept of management had not arrived in India as far as actors were concerned. Actors, as professionals in their own right, had no need to acquire management skills or even understand the concept of management.